The Tunnel (also known as the Underground Tunnel) is a location in Mario & Luigi: Bowser's Inside Story. 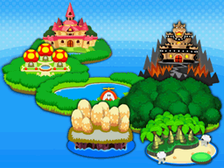 It is located beneath Cavi Cape and located south-east of the Toad Town Caves. 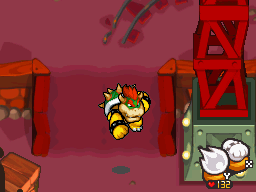 Bowser is catapulted here by a group of Bob-ombs shortly after Fawful abducts Princess Peach by using a laser-like machine to remove her from his body. Only two types of enemies appear here. This area seems to be an abandoned underground railroad. After navigating the tunnels, Bowser meets up with the Monty Bros. One of the four explains that they are trying to make a tunnel that will connect them to Toad Town. They use a huge machine to get the job done. A disgruntled Bowser relunctantly helps them achieve their goal. Mario and Luigi have to go to the Leg Outpost to give him power, though. Bowser has to achieve this before the battery dies in ninety seconds. Bowser's power overcomes the challenge and the machine is totaled. Bowser heads in the next room to the Toad Town Caves. Supersyrup Jar In a brick in the southern scene of the west area. Cheap Ring In a brick in the big room beyond the middle or the rightmost crack in the east area. Rock Shell In a brick in the room beyond the leftmost crack in the east area. Special Fangs In a brick in the southwesternmost scene of the west area. This page was last edited on December 28, 2018, at 11:04.